While some high school students are just getting back into school routines, others have their eyes on what’s to come. 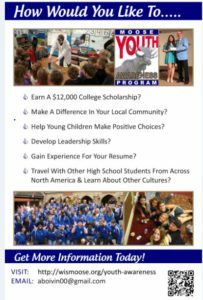 These are the ideal students for the Moose Youth Awareness Program, which gives participants an opportunity to compete for $30,000 in college scholarship money. Five winners, selected by their peers, receive scholarships (1st place – $12,000; 2nd place – $8,000; 3rd place – $5,000; 4th place – $3,000; and 5th place – $2,000). In addition the Wisconsin Moose Association Youth Awareness Program will offer scholarships for the top two as well as runners up based on program participation. In order to participate, students must attend a State Youth Awareness Congress 1 hour information session to gain an understanding of how the program works. During this session, students will identify an issue they want to address – some base it on direct experiences, such as bullying or child abuse; others see a problem they want to “fix.” All topics must promote healthy choices in young children ages 4-9. Students then create their own “Moose KidsTalks” presentations to reach these audiences. Over the next several months, program participants identify their own speaking opportunities in various clubs and organizations, and must make three or more presentations by February, 2019. At the end of February, written reports submitted by those students who have completed at least three “Moose KidsTalks” are judged by a peer group to determine who will represent the state at the annual International Youth Awareness Congress, which is held during the first weekend of May. The 2019 International Youth Awareness Congress will be held in Philadelphia, Pennsylvania (at no cost to students or parents). The Marinette Moose Lodge is inviting local high school students to be part of the Youth Awareness Program. To learn more, call 715-330-1734, or email aboivin00@gmail.com.